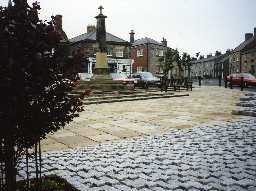 View across Belford Market Place. Photo by Northumberland County Council. Belford is a quiet, attractive village in north Northumberland. It lies mainly between the North Sea coast and the A1. It has long been a stopping place on the Great North Road and, until the 1980s, the A1 thundered through the centre of the village. However, a bypass has now been built and it has returned Belford to a more peaceful state. The earliest evidence for occupation in the area comes from the Mesolithic, a period before farming, when people lived by hunting and gathering wild food. A small cluster of worked flint tools belonging to this period were found in the parish, probably just north of the village. The people who made these tools may have been making the most of the coastal position of this area, with the ready supply of food available from the sea and the coastline. Although people turned to farming, rather than hunting and gathering, in the Neolithic period they have left few traces in Northumberland, and there is no evidence from this period in the parish. It is only in the Bronze Age that we again have monuments, though mainly in the form of burials. A round barrow is known from Early Know, and several other burials from this date are known in the parish. It is only with the Iron Age that we begin to find evidence of permanent occupation around Belford. This is mainly in the form of the cropmarks of Iron Age settlements. These suggest that at this period people were mainly living in round houses surrounded by roughly circular ditched enclosures. This area of Northumberland was beyond the limits of the Roman Empire for much of the period of Roman rule in Britain, so there was little change in the way people lived. Some of these Iron Age settlements may have continued to be lived in during the Roman period. The only possible example of Roman influence in the area is an unusual rectangular cropmark. In Northumberland the move from settlements surrounded by roughly circular walls to those with a more rectangular shape may have occurred during the Roman period, though without further investigation it is not possible to firmly date this site. Little is known of the history of Belford in the 600 years following the end of Roman rule in Britain, about AD410. There are no archaeological remains from the Anglo-Saxon period. However, we know there must have been some Anglo-Saxon occupation in the parish as the village name means 'the river ford of Beola' in Old English, the language of the Anglo-Saxons. We have our first historical references to the parish in the 13th century, by which time it is clear that there was plenty of settlement in the area. As well as the main village of Belford, there were other settlements within the parish. A document of 1296 records the villages of Middleton, Chatton, Warenton and Mousen. These also have Anglo-Saxon place-names so were probably of a pre-Conquest date (that is pre-1066). Although the sites of these villages are known there are few signs of the settlement to be seen today. This is partly because they have shrunk in size since the Middle Ages, but also it is likely that these villages were never more than a number of separate farms, spread across the surrounding countryside. However, there are more medieval remains from Belford. Although the parish church of St Mary was heavily rebuilt in the 18th and 19th century it still contains parts of an older, probably Norman, church. This was not the only medieval religious building in the parish. A small chapel was built on Chapel Crags to the north of Belford. It was probably a private chapel for the use of the Lord of the Manor and his family. It was not far from a holy well dedicated to St Mary. Not surprisingly for a village in the north of Northumberland, Belford was threatened by the constant warfare between the English and the Scottish in the medieval period. As a result at least two fortified tower houses were built, one at Newlands and one at Belford West Hall. This latter tower was also surrounded by a moat. Unfortunately, no remains of either tower can now be seen. In the 17th century Belford does not seem to have been of great significance, and a writer described it in 1639 as 'the most miserable beggarly sodden town. In all the town not a loaf of bread nor a quart of beer, nor a lock of hay, nor a peck of oats, and little shelter for horse or man.' But in 1743 Abraham Dixon inherited the estate and began to invest in the village providing a woollen factory, a tannery, an inn and most importantly Belford Hall. Belford acted as a centre for the surrounding countryside, and gained its wealth from agriculture rather than any local industries. The importance of agriculture in the area is shown by the presence of at least three water-mills in the parish. A number of lime kilns in the parish produced lime, which was probably used to improve the quality of soil in the 18th and 19th centuries. These reflect great investment in agriculture at this period. In 1741 Belford was granted permission to hold two fairs each year, and a weekly market, and would have become a focus for the trade and exchange of crops and livestock. Another important influence on the village was the Great North Road. The mail coach, the 'Royal William', used to pass through the village each day until the railway station opened in 1847. The Blue Bell Hotel dates from the early 18th century, and may have been the 'good inn' built as part of the improvements made by Abraham Dixon. A number of stables and coach houses can still be seen to the south and west of the hotel. They are now used as garages and outbuildings. Another possible coaching inn is The Black Swan Hotel, dating from the early 19th century. Belford Hall and its surrounding gardens was an important part of the village. It was initially built in the mid-18th century, but it was extended in the 1818. The army occupied the house during World War II and huts were built in its historic gardens. After this it fell into disuse and became derelict, but was restored in the 1980s and converted into luxury flats. With the bypassing of the village and the closure of the railway in the last half century Belford has become a quieter, less important village. Although farming remains important, tourism has become increasingly significant. As well as the two inns, there are many bed and breakfast establishments, holiday cottages and second homes in the village. This new form of industry has ensured that Belford will remain a small, attractive and thriving village.